Hi Amazing Kids! June is National Fresh Fruit and Vegetables Month. Fresh Veggies Day is on the 16th and Eat Your Vegetables Day is on the 17th. And, of course, it’s Father’s Day is on the 20th. Also, the 29th is Hug Holiday. So, since June is all about veggies, I’ve come up with some awesome vegetarian-based dishes. But, since it will be Father’s Day (and I know my daddy loves his meat), I’ll throw in a grilled meat dish too! That way, you can enjoy the great outdoors when cooking! So, you could make this menu for your Dad, or make it with your Dad, on Father’s Day! Anyway…. let’s get cooking! Bring 1/2 inch water to a boil in a 10- to 12-inch ovenproof heavy skillet (not cast-iron), then add half of spinach and cook, turning with tongs, until wilted, about 30 seconds. Add remaining spinach and wilt in same manner, then cook, covered, over medium- high heat until spinach is tender, about 2 minutes. Drain in a colander and cool under cold running water. Gently squeeze handfuls of spinach to remove as much liquid as possible. Coarsely chop spinach. Wipe skillet dry. Cook onion and garlic in olive oil over medium- low heat, stirring, until softened, 2 to 3 minutes. Add mushrooms and increase heat to medium heat, then cook, stirring, until mushrooms are softened and have no more liquid left (about 3 minutes). 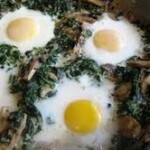 Stir in fat-free half and half, salt, pepper, nutmeg, and chopped spinach and bring to a simmer. Remove skillet from heat and make 4 large indentations in spinach mixture. Break an egg into each indentation and bake, uncovered, until egg whites are set but yolks are still runny, 7 to 10 minutes (or until your doneness liking). Lightly season eggs with salt and pepper, and then sprinkle with cheese. Put oven rack in lower third of oven and preheat oven to 500°F. 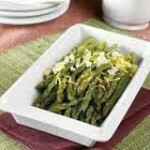 Toss asparagus with oil, salt, and pepper in a large shallow baking pan. Make asparagus into1 layer. Roast, shaking pan once about halfway through roasting, until asparagus is just tender when pierced with a fork, 8 to 14 minutes total. Serve asparagus sprinkled with goat cheese. In a large baking pan, combine the marinade ingredients. 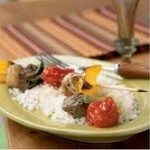 Assemble the kebabs by alternately spearing the beef, peppers, onions, mushrooms, and tomatoes on skewers. Twist one rosemary sprig around each skewer. Set the kebabs in the marinade, cover and refrigerate for at least two hours. Occasionally turn the skewers for an even coating. Prepare the grill and grill the kebabs until sizzling, or until cooked to desired doneness. For dressing, in a medium bowl, whisk together zest, orange juice, mint, and honey. 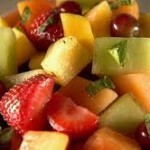 Add fruit to dressing; toss lightly to coat. Keep refrigerated, until ready to serve. The name pine-apple was the original name for a pine cone (grows on pine trees). Because the fruit pineapple looked like a huge pine cone, it too was called a pine-apple. Pineapples contain an enzyme that is used in blood tests. Green bell peppers have twice as much vitamin C as citrus fruit, red peppers have three times as much. Lettuce is sometimes called Green Gold in California. It is the most important vegetable grown in California, and about 70% of lettuce grown in America is produced in the “golden” state. There are three types of asparagus, green, white, and purple. Green is the most common in the United States, while the white variety is very popular in Europe. The scientific name for asparagus is Asparagus officinalis. Tomato is actually a fruit. It took a ruling by the Supreme Court in 1893 to make the tomato a vegetable. The word “Dad” got originated in the 16th century. It might have got its origin from the Welsh word ‘tad’ (father) that later got altered to dad. The word ‘father’ is basically derived from the Old English word – ‘foeder’. Father’s Day was first celebrated in America. Sonora Dodd of Spokane, Washington, wanted to have a special day to honor her father, William Smart, who was a widowed Civil War veteran and had to raise his six children on a farm. It was decided it would be celebrated the month in which William Smart was born. Despite all the popular gifts, a rose marks to be the official gift of Father’s day. Don’t forget, June 29th is Hug Holiday, so make sure you give out all those free hugs! I know I will! Happy June, Amazing Kids!